Vibe Hotels - Hollywood’s Cool Hotels and Motels in Los Angeles, California, USA. The Vibe Hotel has a great location. 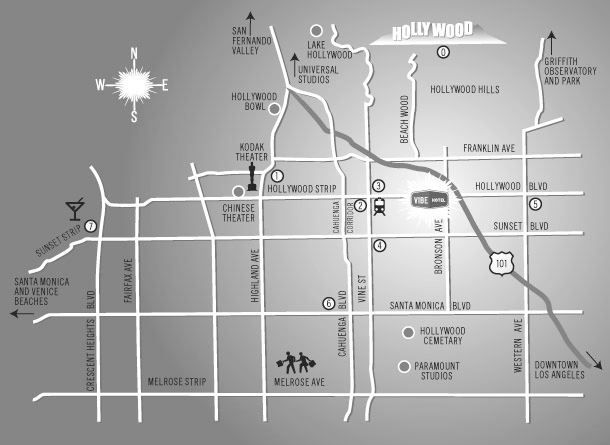 You’ll be right on Hollywood Boulevard in the Heart of Hollywood only blocks away from all the action. We are cheap accommodation in the middle of Los Angeles. You can see the Hollywood sign from our court yard and will be close to all the cool stuff but won’t have to get caught in all the hassles of busy traffic, crowds and parking problems. You can motor right up to your Motel room and walk to all the hot spots or have access to the Hollywood 101 freeway within one block. Accommodation with LA’s public transportation easily accessible and bus stops right out in front of the Motel on Hollywood Boulevard plus the metro subway is right down the street from the Vibe Hotel. Centrally located in Los Angeles you can access all of LA by foot, bus, subway, bike, train or car. Mapquest Map Directions Click on map to see it Bigger ! Which can be seen from our courtyard, bike or hike to it or to the Bronson Caves or Griffith Park with over 4,210 acres of both natural chapparal-covered terrain and landscaped parkland and picnic areas, it's the largest municipal park with urban wilderness area in the United States and it's right down the street from us. Which has become the "Times Square" of Los Angeles with the Walk of Fame, live TV shows, the Chinese Theater, endless shops and food, plus the Kodak Theater home to the Academy Awards. Has over 28 bars and nightclubs offering a party for all moods and all types of hipsters. The Historic Intersection has the subway metro rail station linking you with the rest of Los Angeles, and also features the Pantages Theater and Frolic Room bar. Coming soon will be the W hotel complex of amazing new restarants, shops, bars, hotel and much more. Has been redeveloped featuring shops, theaters, restaurants and things to do for any budget. Including the Arclight Thearte complex, one of the best places to see current movies. Has access to the Los Angeles subway metro rail and a huge discount grocery store. Is very close with an array of small acting theaters, this is where many big stars get their start acting and performing. Is probably the place you'll see the most stars at night partying in some of the most famous nightclubs in the world. Right next door is the Palms Thai Restaurant, it is the best Thai restaurant in Los Angeles. Also within walking distance is the Henry Ford Theater or 'Music Box' for concerts and shows, the giant Create nightclub, the glamorous Pantages Theater for live theater, the classic Palladium nightclub, the Avalon nightclub, and more. Close to the Vibe Hotel are the following places: The Dolby Theater (1.2 miles), The Hollywood Bowl (1.7 miles), Griffith Park (1.7 miles), The Greek Theater (2.7 miles), The Hollywood Sign (3.9 miles), Universal Studios (4 miles), Downtown LA (6 miles), Santa Monica Beach (13 miles), Magic Mountain (29 miles), Disneyland (32 miles). RATES........... Special DISCOUNT RATES at the Vibe!!! Save $20 per week when entire week is paid in advance and with cash. • Rates are subject to change at anytime. • Weekly discounted rates must be paid in cash and in advance. • Rates are subject to fourteen percent Los Angeles City tax when applicable. • A valid VISA OR MASTERCARD CREDIT CARD IS REQUIRED to reserve or stay and the card must be in the name of the guest. • No debit credit cards for reservations, ok to pay at front desk. • The credit card is to hold the reservation and for the deposit, it will not be charged unless there is a no show or deposit problem. • Once you have paid for your accommodation there are no refunds. • Cancellations for reservations must be made more than 48 hours in advance or you will be charged a no show. • No shows are charged an administrative fee of one night plus seven dollars. • Once you arrive you must pay before you can stay, we accept cash, traveler's checks and Visa or Mastercard for payment. • There is an administrative fee of five percent per transaction for any payment made to the hotel. • There is a discount of five percent per transaction for any cash payment made to the hotel. • There is a 28 day maximum stay, no exceptions. • Check in is after 2:00 pm but if you arrive earlier we will try to check you in if the room is ready. • Check out is at 11:00 am. • If you will be arriving after 6:00 pm please confirm with us the day of your arrival. • Parking is free, it is limited and first come first serve, there is also ample street parking. • All rates are available only through this web site. Thanks for choosing the VIBE hotel! Premium Private Rooms have a Queen size bed alone OR a Queen plus one Twin bed OR a Queen plus two Twin beds in a bunk, a full kitchen, plus,a 32 inch TV with satellite, air conditioning, and a private bathroom with bathtub and shower. Budget Private Rooms have a Queen size bed alone OR a Queen plus one Twin bed OR a Queen plus two Twin beds in a bunk, plus a 32 inch TV with satellite, small refrigerator, microwave, air conditioning and private bathroom with a shower. The Vibe is a great place to meet other hipsters that are in Hollywood or Los Angeles for all sorts of cool stuff. It's a Hollywood Motel where you can hang out and meet actors, dancers, musicians, models, entertainment industry types, international travelers and more. The rooms are decorated funky and have a swinging retro 60's groovy motel feel. The Vibe offers a clean place to stay with good basic amenities at a very good price, especially the weekly motel rates. FREE Internet - There are 2 rooms open 24 hrs. featuring 6 Apple computers with high speed connections. FREE Parking - Park close to your room with covered parking spots, it is limited and on a first come first serve basis, there is also ample street parking. FREE Wireless - Wi-Fi Hot Spot for laptop or smart phone users. FREE Breakfast - Cereals, oatmeal, toast with peanut butter, jellies and jams, plus coffee and tea. FREE Coffee & Tea - Hot and delicious available all day and night. FREE Movie Room - Theater style lounge with the lastest releases on a BIG screen and 5.1 surround sound. FREE Social Nights - Lots of fun with a cool crowd of people, guest DJ's, live bands and free refreshments. Super Clean - High standards of housekeeping to keep you comfortable. Laundry - Coin operated machines available. Billiards, Basketball, Karaoke, Ping Pong, Foosball, & More - Fun for everyone. Weekly Discounts - Discounts available through this web site. Newly Remodeled Rooms - Funky Retro Cool Rooms with vibrant colors and hip touches like oversized bathroom mirrors, vintage tile and furniture, big TV's, and full kitchens. Satellite TV - All rooms have satellite TV with hundreds of channels including and . Click here for : "MORE TOUR INFO"